The Consumer Product Safety Commission (CPSC) announced several product recalls last week, including one for a dangerous child’s toy which can cause choking and which has been involved in a death. Also recalled were a high-end bicycle with defective brakes and a flat screen television which can overheat and catch on fire. About 1,500 of these small water-absorbing toys have been recalled by the importer, Doodlebutt of Lehigh Acres, Florida. The Jumbo BeadZ toys are marble-sized water absorbing balls and the Magic Growing Fruity Fun toys are water-absorbing polymer shapes, such as apples, bananas, butterflies and cherries. The CPSC is aware of one incident in which an 8-month-old girl ingested the ball and it had to be surgically removed and two cases outside the United States, including one resulting in death. 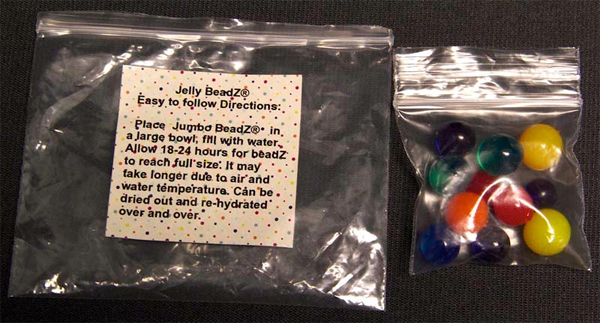 The CPSC warns children can mistake the toys for candy and when swallowed, they can expand inside a child’s body. The toys can absorb 300 to 500 times their weight and grow up to eight times their original size. Children can suffer vomiting, dehydration and life-threatening injuries. Another problem is similar toys have not shown up on x-rays. The toys were sold through Amazon.com from February 2012 to September 2013 for about $9. Consumers are advised to take the products away from children immediately and stop using the product. They can contact Doodblebutt for a full refund. Read the CPSC recall notice. Eight retailers have recalled the 32″ Coby Flat Screen Television due to fire and burn hazards. These retailers have initiated the recall because Coby USA, the product importer and distributor, has gone out of business. The CPSC has received reports of six incidents involving televisions overheating, smoking or catching on fire. No injuries were reported, but there was some property damage. In two cases, televisions caught on fire and one also scorched a wall. The televisions were sold nationwide from August 2011 through November 2013 for between $170 and $260. Read the CPSC recall notice for the model numbers involved in this recall. Trek has recalled several models of its year 2013 Madone bicycles after five reports of loose front brake attachment bolts. No injuries have been reported, but consumers are advised to stop using the bicycle and take it to a Trek dealer for a free replacement front brake system. The bicycles were sold nationwide from July 2012 through this month for between $3,400 and $6,300 and for custom models, up to $15,000. About 6,300 bicycles are involved in this recall. Read the CPSC recall notice. The Boston product liability lawyers at Breakstone, White & Gluck have over 100 years combined experience representing clients injured by defective products, including toys, automobiles and medical devices. If you have been injured, it is important to learn your rights. For a free legal consultation, contact us at 800-379-1244 or 617-723-7676 or use our contact form.